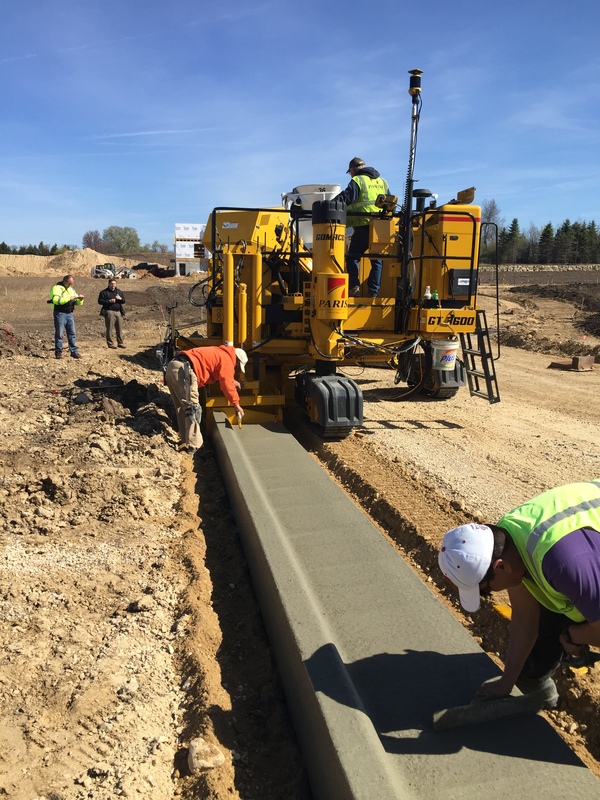 The concrete industry, Wisconsin Department of Transportation and the cities across Wisconsin have been watching and wondering which construction company was going to be the first to utilize 3D stringless or automated machine control in a slipform placement process. We all imagined that it was going to be a stringless slipform paver. But, we forget that this technology can be utilized in many different parts of our construction industry. Parisi Construction of Verona, Wisconsin is the first contractor in Wisconsin to invest in the equipment that will allow them to place curb and gutter, sidewalk and concrete barrier. Parisi’s new GOMACO GT3600 equipped with Global Positioning System (GPS) and laser vertical control augmentation debuted on Tuesday, April 28, 2015 on a subdivision project on Madison’s southwest side. 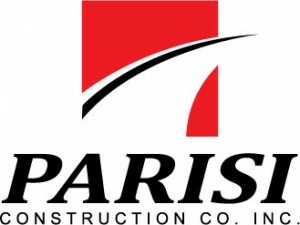 According to Jeff Parisi, President and Owner of Parisi Construction Company, they were due for replacement of their curb and gutter machine. And, as the staff were working on the order with Gomaco, they came to Jeff and asked him if they could add this equipment. They were convinced that with the subdivision work and the site development projects they have to build in 2015 there would be immediate payback by going stringless. Parisi stated that his staff put a lot of work into this. For every project they assure that the proper survey control is in place, develop the surface model for guidance of the machine, prepare the grade and perform the quality assurance of tolerances to line and grade. 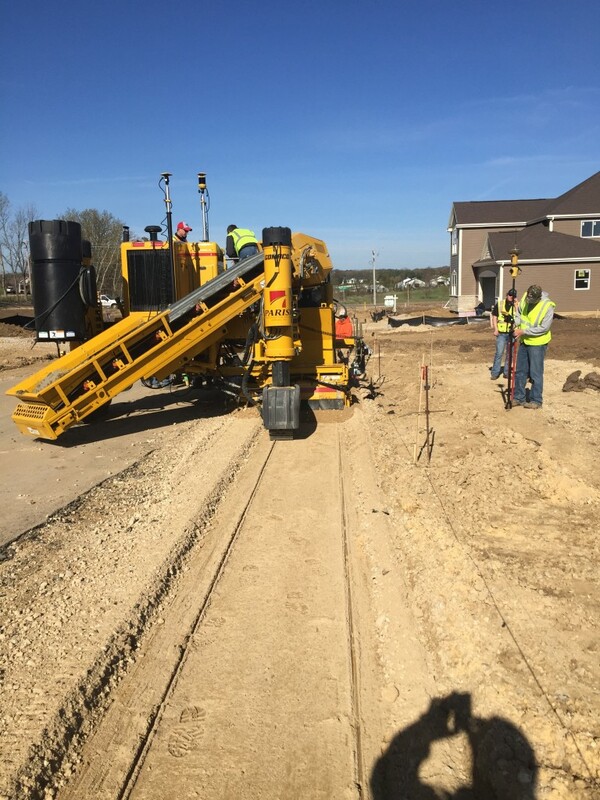 The benefit of going to this technology and equipment include the time and cost savings of survey staking and setting paving pins and string line, the additional mobility and freedom of movement without the stringlines present and the ability to do tight radiuses and curves in any roadway, parking lot or island design. The equipment includes the GPS base station and three lasers. The GPS antennas on the GT3600 are used to track the machines movement and calculate its position and heading. The lasers augment the GPS and provide the required vertical accuracy. In addition, a GPS rover is utilized to check alignment and grade. 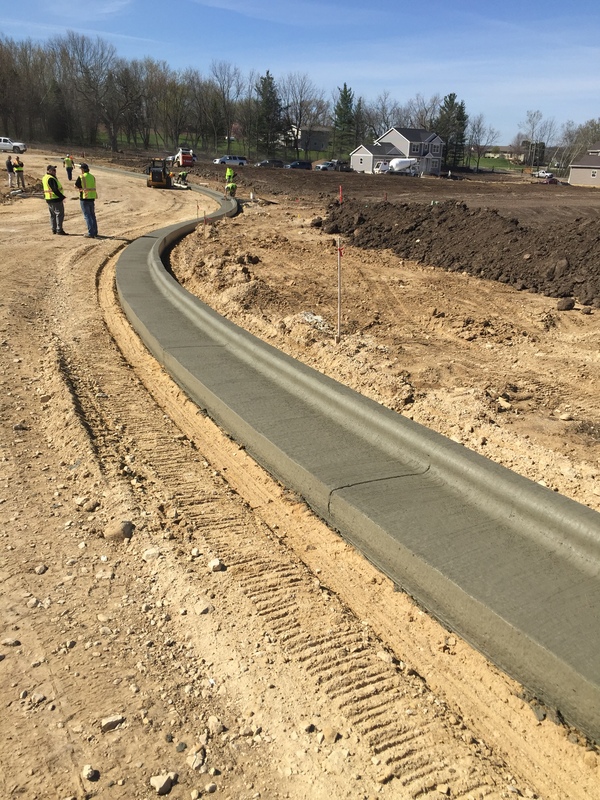 On this project in Madison, the Parisi staff accommodated the request of the city engineering staff to put up a short run of traditional stringline so that they had a perspective on the accuracy of placement. In that area, the rover showed that they were within one hundredth of a foot of the proposed line and grade. By the time they hit the end of the stringline, everyone was comfortable in proceeding stringless.